Initial jobless claims fell 2% to a seasonally adjusted 340,000 for the week ending March 2, according to a Labor Department report released today. After dropping a revised 5.2% the preceding week, this newest data marks the fifth consecutive week of decreases. Market analysts were pleasantly surprised, having expected a slight 2.3% increase to 355,000 over the previous week's revised numbers. For more long-term perspective, the four-week moving average also decreased 2%, to 348,750, for the second consecutive drop in initial claims. Both the most recent week's number and the moving average clocked in solidly below 400,000, a cutoff point that economists consider a sign of an improving labor market. On a state-by-state basis, a large drop in initial claims from California made the biggest impact on the week ended Feb. 23 (most recent available data). The Golden State registered a 40,350 decrease, citing fewer layoffs across the sectors, but especially in services. New York and Texas also recorded decreases of 2,070 and 1,300, respectively. Three states felt increases of more than 1,000 in initial claims. Massachusetts bumped up 4,000 due to school vacations and inclement weather, while North Carolina (+2,000), and Illinois (+1,780) pointed to construction layoffs as the primary reason for the increase. 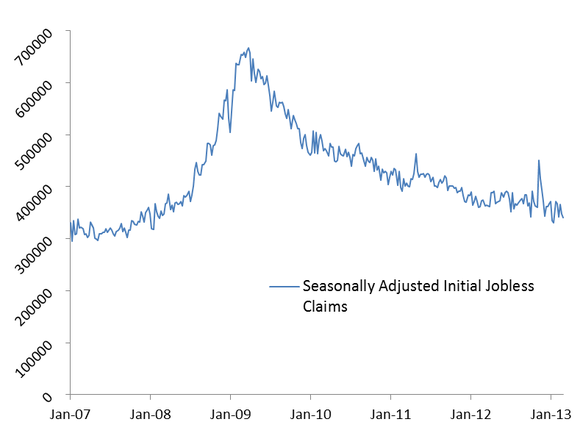 The article Jobless Claims Drop for Fifth Straight Week originally appeared on Fool.com.